Ivan Denisov, MSWC, repeated Russia champion, Europe and World. Repeated record-holder of Russia, Europe and World. In 2005 in Moscow at the World Championship Ivan set absolute world records in jerk equal 175 reps and total biathlon amount in 281 points. These records earlier belonged to Sergey Mishin and were permanent over 10 years. Confidently performing at the championships of various levels in classical biathlon, Ivan Denisov has the records of Russia and World in other kettlebell lifting discipline such as long cycle. At the World Championship in 2007 Ivan performed 109 reps. At Russian Championships Ivan has won six times again in long cycle. 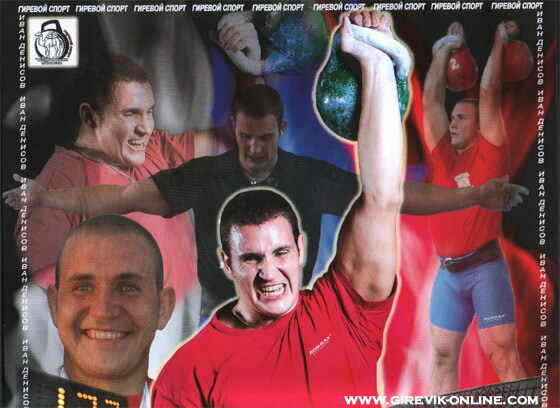 Ivan Denisov represents Chelyabinsk kettlebell lifting. In 2004 Ivan finished Chelyabinsk Military Automobile Institute with golden medal. He started doing kettlebell lifting there. While studying at the Institute he achieved good results, being three-time World Champion. In 2006 Ivan finished the Ural State University of Physical Culture and got the degree with distinction. At present time he is a graduate student of the second year. At present time, Ivan perfectly combines excellent work-outs and performance with coaching activity. His students are Denis Gafarov and Kseniya Dedyukhina have already recommended themselves on the Russian and International levels.